ATLANTA, Georgia (CNN) -- The Jimmy Carter Library and Museum will close in April for a five-month, $10 million renovation, Carter told reporters and dozens of Atlanta-area schoolchildren Thursday. 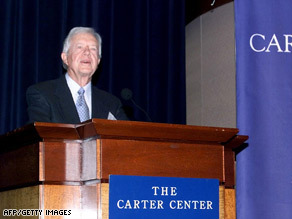 Former President Carter speaks at the Carter Center in 1999. The center is getting a $10 million renovation. The project will transform the center into a more interactive site highlighting the life of the 39th president from birth through his post-White House work. Except for the replica of the Oval Office, none of the 23-year-old, 24,000-square-foot museum near downtown Atlanta will remain in its current state. Additions will focus more on the center's work abroad, Carter said. "We hope that Atlanta will become much more attuned, through the presidential library, to what is going on around the world," he said. An interactive table will help visitors gauge the center's effect internationally, which he predicted will extend far beyond Atlanta. "This is probably going to become the new model for presidential libraries around the world," Carter said. Among the displays will be one that will walk visitors through his typical presidential day, which started at 5:30 a.m., and will include entries from the diaries that he has kept through much of his life, he said. In response to a question from one child about what he has been doing lately, Carter said his primary source of income is as an author. He has written 24 books. For the past 27 years, he also has been a professor at Emory University. But the work has not kept him from pursuing leisure activities, including fly-fishing in Argentina, Chile and New Zealand, he said. Carter grew up during the Great Depression in the Deep South, served as governor of Georgia and won the presidency in 1976. He lost his bid for a second term when Ronald Reagan bested him in the 1980 election. In response to a question from another child about whether his work had tired him, the 85-year-old said his four years as president were "one of the greatest experiences that any human being could have. I didn't get any more tired being president than I did picking cotton or shaking peanuts when I was younger." Despite the nation's current economic mess, Carter said it is far better than it was during the 1930s, when he was a child. "The Great Depression was much more severe," he said. "Back in those days, there was no money." He said it was not unusual for more than 100 "hobos" traveling on foot to stop at his parents' house in south Georgia and ask for water or a sandwich and work. Many of those seeking help were college graduates and former factory foremen, he recalled. Carter said he has "full confidence" that President Obama's effort to resuscitate the economy will be beneficial, but he predicted "it will be a lot worse before it turns around." That may take another six months, he said, adding that Obama, a fellow Democrat, "inherited a horrible situation." Carter said the center has raised $7 million for the work, but is still looking for the remaining $3 million, all through private donations. It is slated to reopen October 1, Carter's 85th birthday. The designer, Gallagher & Associates, has also worked on exhibits for the Center for Civil and Human Rights in Atlanta and designed the Spy Museum in Washington, the "Public Vaults" displays at the National Archives and the visitors center in Gettysburg, Pennsylvania. The center has been recognized for its work in helping resolve conflicts, monitoring elections, supporting human rights and preventing diseases around the world.